Acid deposition is considered to be one of the greatest threats to the environment in industrialised countries. Recognising this , governments have instituted programmes to reduce emissions of SO2, and NOx, the major sources of acid rain. But is this enough? Will ecosystems damaged by acid rain recover? And if they do, how quickly? What ecosystem processes determine the rate of recovery? Do acidification models give accurate predictions? Are any other actions necessary to promote recovery? To answer such questions without waiting for the results of current policies, scientists in Sweden and the UK decided to eliminate acid deposition on an acidified ecosystem altogether, and monitor the effects. They did this by constructing a huge roof over an acidified catchment near Lake G?rdsjon in Southwest Sweden. Acid rain falling on the roof is diverted away, and replaced with clean rain. The detailed responses of the ecosystem are measured. This book records the results from the first five years of the Project, and considers the implications for emission control. The book describes the effect of eliminating acid deposition (and some other pollutants) on vital ecosystem processes both chemical and biological and how the predictions of acidification and hydrological models compared with experimental results. It describes the covered catchment, how the roof was constructed and the problems associated with such large experiments. The implications for pollution control policies, and what still needs to be discovered, are emphasised. The book should be of interest to a wide variety of environmental scientists, especially those interested in pollution effects, forestry, freshwater fisheries, and ecosystem function, and to environmental managers and policymakers. 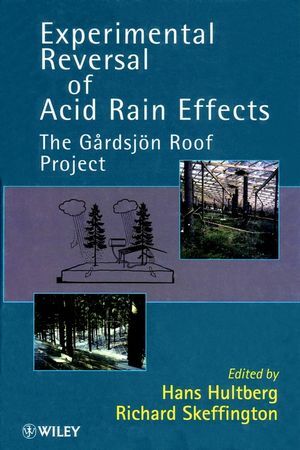 Hans Hultberg and Richard Skeffington are the authors of Experimental Reversal of Acid Rain Effects: The G?rdsjön Roof Project, published by Wiley. Recovery from Acidification: The Background to the CoveredCatchment Experiment at G?rdsjon (R. Skeffington, et al.). Atmospheric Deposition to the G?rdsjon Research Area (M. Fern &H. Hultberg). Changes in the Soil Solution Chemistry After Exclusion of AcidDeposition (R. Giesler, et al.). Trace Metals in the Lake G?rdsjon Catchments (B. Lyven). Fine-Root Response to Nitrogen Removal and Addition (A.Clemensson-Lindell & H. Persson). Modelling Soil Acidification and Recovery in a Roofed Catchment:Application of the SAFE Model (H. Sverdrup, et al.). European Experience of Manipulation of Forest Ecosystems by RoofCover: Possibilities and Limitations (C. Beier, et al.). Reversal of Acidification: Policy Implications Derived from theRoof Project (H. Hultberg, et al. ).